Birthplace: Partington, Greater Manchester, UK. Brothers Peter, Neil, Philip, Stephen. Sister Ann. 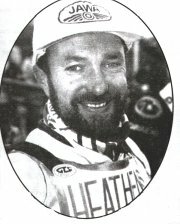 Les became the third member of the Collins clan to join the Heathens, many years after both Phil and Steve had departed. It was during the year at Stoke in 1996 when boss Jan O.Pedersen strengthened a struggling team to bring him as a replacement for Steve Knott. He had embarked on his speedway journey with the Belle Vue Training School when just 14 years old, and also raced schoolboy grass track with the Lancashire Grass Track Junior Riders Club. He made his league debut with Crewe in 1975 before being snapped up by Belle Vue for their British League team. After a season on loan at Stoke, he made his name with three full seasons in Manchester along side elder brother Peter, but then left the Aces and the shadow of the former World Champ, for four seasons with Leicester. It was with the Lions where he achieved his highest individual recognition with second place in the 1982 World Championship behind Bruce Penhall. In 1985, Les moved to Sheffield which saw his average drop by around a point by the end of the season. After failing to settle with the Tigers, he went back to the lower division with Edinburgh in 1986. After a year on loan, achieving a massive 10.00+ average, the Monarchs signed him on a full transfer and he was to stay with the Scottish club as a heatleader, right through until 1995 without a gap. However, in '96 he could not agree terms and started the season sitting on the sidelines. That is until Cradley moved in to snap up his talents. At the ripe young age of 38, he instantly won the hearts of the Cradley faithful with some of the best racing seen anywhere in speedway. A measure of the impression he made is with the standing ovation he received at the club's annual end-of-season dinner and dance. The rousing reception easily surpassed those for both Billy Hamill and Greg Hancock, who had finished first and third in the world, respectively. It took Les just a few matches to catch up with the rest of the league who had been given a months head start, and by the Summer he was frequently paid for double figure scores at home while providing useful experience and backup to Hamill and Hancock on away tracks. His best score was of eleven points, achieved on five separate occasions. At the other end of the scale, he scored three points on his Heathens debut but only fell below that score on one occasion in the league. Even at this stage in his career, Les was producing passing manouevres that most riders could only dream of. He could find spaces which no-one else could see, and even Greg and Billy at the very top of their game could not fail to be impressed. On top of it all, Les was 100% fair with every opponent. You would never see him take a rider too far or put himself or anyone else on the track in danger. Quickly nicknamed as 'The Beard', he reached almost cult status and has always been one of the first names on the team sheet to represent Cradley in the challenge matches that have continued since the club's active closure. + In addition to such an impressive club career, Les has an impressive international CV to match. In the run-up to that memorable 1982 World Final in Los Angeles, he had sent out a warning to the rest of the field by winning the final qualifying round, the Inter-Continental Final. Before that, he had been crowned British Under-21 Champion in 1977, Division 1 Riders Champion in 1980 and has narrowly missed out on the British Final rostrum with fourth place on three separate occasions. + His appearances in the Division 2 Riders Championship have now reached double figures, while he also qualified for the Division 1 Final on five occasions. He made it to two World Long Track Finals and won both the Four Team Tournament and Pairs competitions while with Edinburgh . 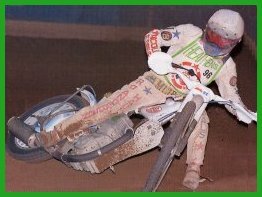 In 1997 after Cradley's spell at Loomer Road came to an end, Les actually stayed on for a year, riding for the returning Stoke Potters in the second division. After a subsequent spell out of the sport and just when everyone was expecting Les to hang up the leathers for good, he was then tempted back by Glasgow in 1999. Naturally, the impression was a notable one once more, and he has stayed in the Tigers team alongside son Aidan to form a very rare, if not unique, father-son partnership in the same side. Web site created and maintained by Steve & Phil Johnson. E-mail me your comments and suggestions.